How To Smoke a Tri Tip Slow and Good! Jake asks: I need a good recipe and directions on how to smoke a beef tri tip roast that weighs about 3 lbs. Can you please tell me how to smoke a tri tip? What temperature should the smoker run at? 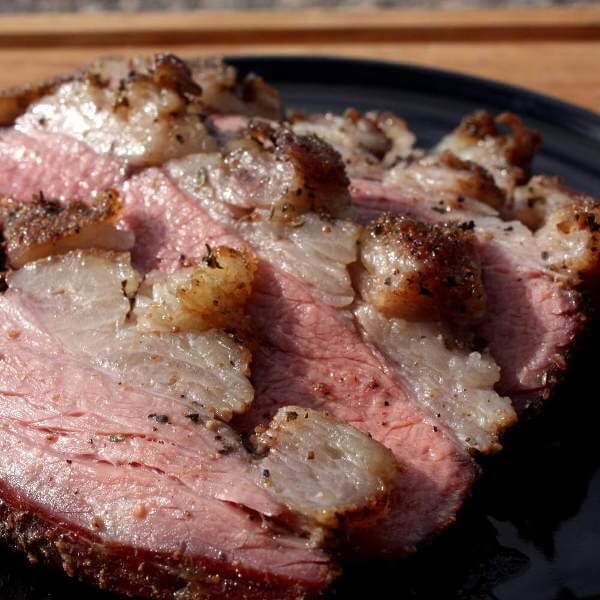 What are your favorite tri tip seasonings? 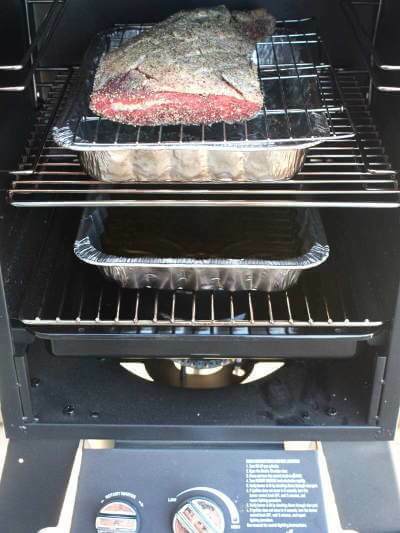 What is the best smoker temperature for smoking a tri tip? I have a Cajun Injector electric smoker. How long do I smoke it and at what temperature? Smoking a tri-tip I don't sweat the temperature as much. 225-300 degrees is just fine. I offset me my coals on one side of the smoker using a combination of pecan wood and charcoal.. get the fire going and let it burn down good. Agreed, you never smoke food until its reduced to clean burning coals.. then put your meat in. I always let mine sit for a few hours at room temp before putting it on the smoker. This is my major diff I guess from others. I do not use a rub, and here is why. When I first put the meat in I do it right over the hot coals turning once...searing, sealing, and carmelizing the outside. A rub would just burn. Then I put it on the far side of the smoker (fat side up) to let it slowly come up in temp. That way its self basting. I keep track of the temp and pull it off at 135˚ and let it rest about 10 minutes before carving about 1/4 thick across the grain. One method missing would be to cover the roast with BACON! This works better then mopping and adds a wonderful flavor while keeping the meat moist and juicy. I've got one in my smoker now for July 4th. I use a gas smoker at 200 degrees, cover the tri tip with Cajun seasoning, set the meat on the rack with the fat side up and cook it for about 4 hours. As long as you keep a water pan full in the smoker, the meat will stay juicy. I also cook a couple of beer can chickens at the same time, using hickory chips that are soaked for at least half an hour, with the same Cajun seasoning. Just make sure the tri tip is on the top rack so the chicken fat doesn't drip on it. Beer can chicken is always great, but even better when smoked because the beer and water pan avoid the dryness of some smoked meats. You can even let the chickens cook about 6 hours at 200 degrees because it simply will not dry out. After I take them out from a 6 hour session, the juice pours out of them when you cut them. The 6 hours (again, at 200 degrees) really allows the smoke flavor to set in. It's great! Take your roast; sprinkle with salt then genorously with black pepper, cut 4 cloves of garlic and spread evenly over meat. Add fresh thyme, basil, and rosemary; rub over meat. Let sit over night tightly wrapped in plastic wrap. Before cooking let meat arrive to room temperature. For Tri-tip or beef, I prefer Apple Wood to accent the flavor as it adds sweet tones to the roast. If smoking, let your fire develop coals so the smoke coming off the grill is lighter before placing meat on grill. Never place the meat on a freshly made fire as the smoke taste will be FAR too intense. Grill heated by charcoal and wood will typically take 45 minutes to an 1 hour before meat can be placed on it. Keep your fire between 180 to 200 degrees. Total cooking time will vary based on roast size but will be approximately 1 hour per pound. Remove roast from smoker when thickest (Center) part of roast reached a temperature of 130 degrees. This will allow for rare at the center and all ranges all the way to well done on the outer cuts of the roast. Let stand before cutting for 15 minutes to allow roast to rest. Slice against the grain in desired thickness. 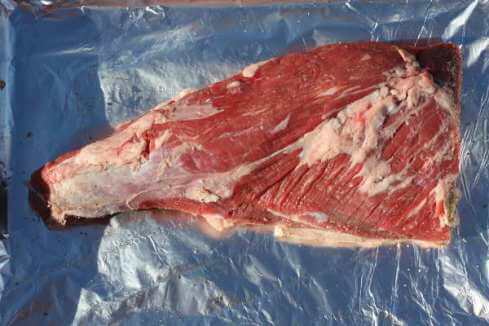 A beef tri tip roast is a lean piece of meat and shouldn't be cooked past medium, and preferably to medium rare, or about 135 degrees. One trick that really helps the meat become tender and juicy is to salt it heavily the night before and refrigerate it overnight. 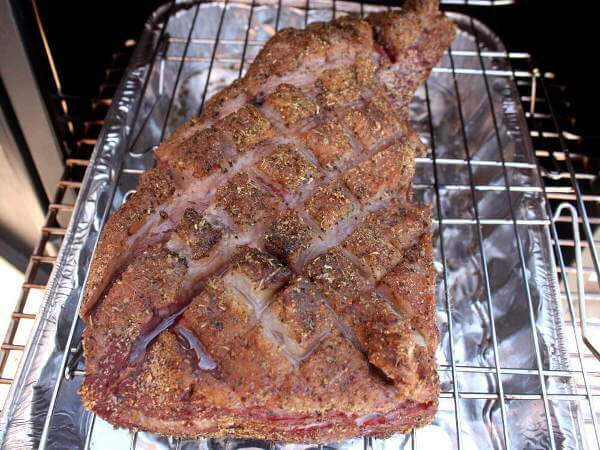 Before smoking, rinse it off well, pat dry, and season with a low salt or unsalted dry rub mix. Or you can simply season it with some black pepper and garlic powder. Smoke it at 225˚F until it reaches 130-140 degrees, depending on how well done you want it. Remove it, cover it with foil and let it rest for 10 minutes before slicing thinly across the grain to serve. Searing does not "seal" in any juices from the steak. What you are looking for when you sear is the maillard reaction. This browning process adds loads of flavor.